Dang Drake you look like a little kid that just met their Idol, nut I get it its Stevie Wonder. 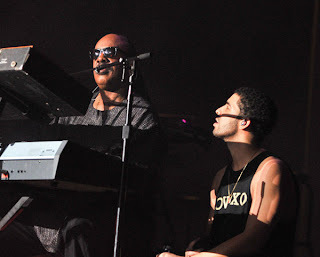 Drake and Stevie performed together at the 2nd annual OVO festival in Toronto. Smookin, Sanaa Lathan looks great at the Ellis Moss 10 year Anniversary celebration in Hollywood yesterday. Closet freek, La La Antony at the Trachtenberg showroom in Manhattan yesterday, if I had the access I would be in all the designers showroom.